Rich in story, Empires is much greater than the sum of it's parts when it comes to the overall title. 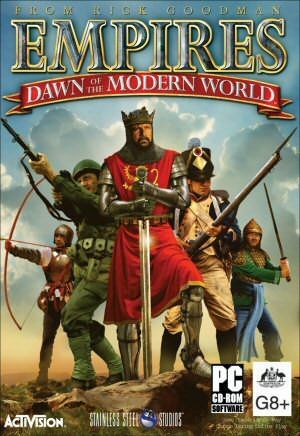 At first my opinion was that it'll just be Age of Empires but with a new name and then when it got down to the nitty gritty and we were in the title proper, it struck me that this particular game has one riveting quality that many of them out there don't: a good story. Stepping back a bit from the set tradition of encompassing as much time and history as possible within the one game, Empires focuses on specific events that shaped the world as we know it and allow you to play through them. There are three main focus points that allow you to play as either the English, Korean or Americans and it's from that viewpoint that we get to experience the gameworld. Play involves major and minor missions and puzzles. For the most part the experienced gamer should be able to figure out most of them, others might need a bit more time. With the ease at which one can pick up this game, that does not present a problem and all comers to the title should be up and running quickly and easily. One of the first things after getting up and running you will notice is that this game looks good. Damn good. 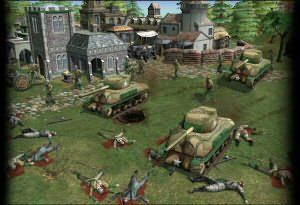 Stunning 3D landscapes and spectacular cinematics truly make it stand out and above the current crop of RTS games that have inundated us. All manner of detail has been incorporated, including real time lighting effects and lavishly detailed environments. If any further proof was needed, just check out the gorgeous screens to the left! The feel of the game is very open ended as opposed to other titles in the same genre. There will be periods where there is a sensation of free falling as you will play for a considerable amount of time without a primary objective making itself known. Then when the action occurs, and occur it will, everything moves up a notch and you will find yourself in the middle of some very gripping gameplay indeed. 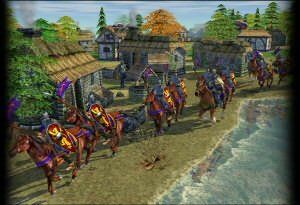 If compelling gameplay is anything to go by then Empires is a must own title for any fan of the RTS genre. As you might expect funnily enough, strategy is key to winning the game and the sheer size of the levels will enable you to sneak around pretty stealthily, even to the point of surprising the enemy and having the advantage over them. The great thing about the title is even though in the single player area of the game you are stuck with only a few empires, these are expanded by the time you decide to take the big step and go multiplayer. A world of new tactics and opportunities awaits and the thrill of vanquishing a real live human foe is always electric. Another nice thing is that as you progress through time your civilisation will have to take on the persona of it's modern day counterpart to reflect the change in time. A blessing in this title is that even for the single player experience, the in game AI is not going to let you down. A challenge is what lies ahead and it will test your playing ability to the extreme. 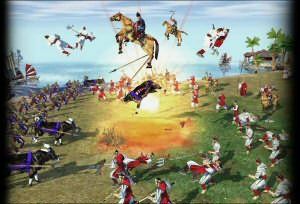 There are two main ways of getting into a game and that is a quick match or a campaign. I found the quick games refreshing as sometimes it quite simply took too long especially in multiplayer in campaign mode. For those of you who like to see their games up close and personal, Empires comes with an intuitive camera system that will allow you to swoop down and check things out. I found that the closer I got to the action though, the harder it was to keep an eye on everything. So be warned, it might be easier to back off just a little bit in order to keep control of all your players in the game. When up close however you will appreciate the level of detail that has been put into both the appearance of the game and the animations of your men, as they don't all just do the same thing at the same time as is so often the case with these titles. All things said and done, this is a RTS that has almost nothing wrong with it. Whilst not really exploring any new ground, it does provide for a very solid, streamlined playing experience that should keep new and old players going with many, many hours of entertainment. Great Stuff!